Located in the Tip Top Media Arts Building, for nearly two decades this printmaking studio has offered workshops, private lessons, exhibitions, and events in a working studio that routinely churns out some of the best print art in the state. Penelope Bennett moved to the US to attend Hunter College, and later, Cooper Union in New York City. For a period of thirteen years, Bennett lived and worked in Spain. 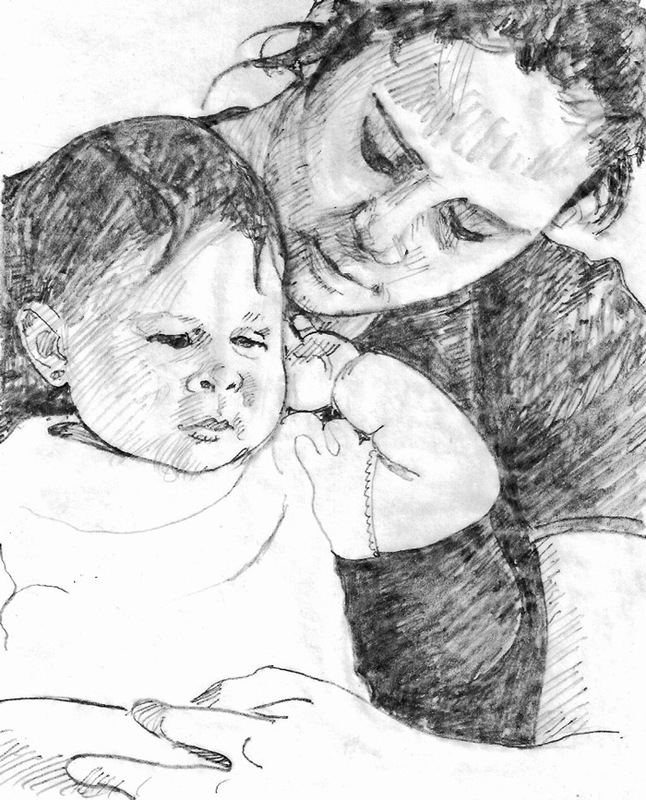 She currently divides her time between large scale portrait commissions and etchings. Bennett has exhibited her work in the US and abroad including exhibitions in Paris, London, Barcelona, and New York City. Her work is in many public collections, including Guild Hall, East Hampton, New York; the Museo de Art Contemporani de Villafamés, Spain; the Museo de Bellas Artes, Mexico City; the Museum of Art at the University of New Hampshire, Durham. 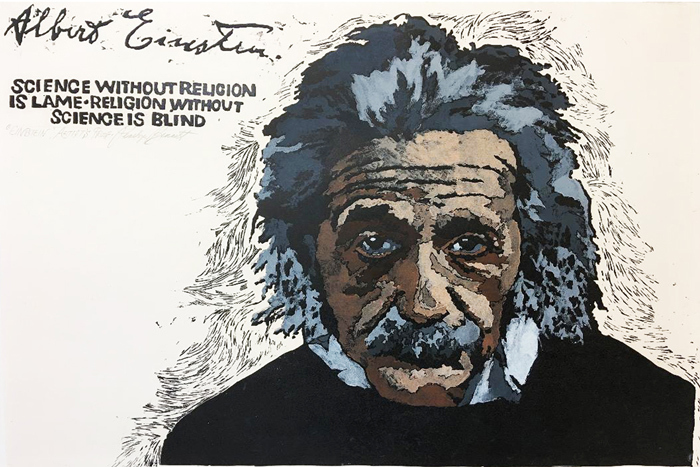 It is also in the private collections of Harry Belafonte, Leonard Bernstein, Kenneth Clark, Allen Ginsberg, Diego Hidalgo, Norman Miller, Gregory Peck, Benjamin Spock, Gloria Steinem, Josep Lluis Sert, and Kurt Vonnegut, among many others. 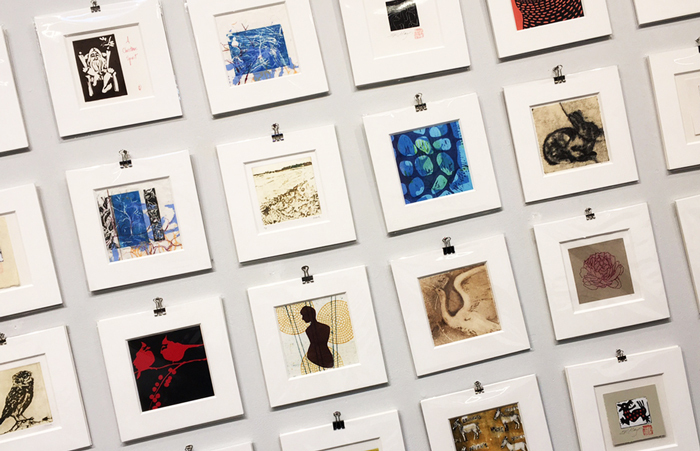 Two Rivers Printmaking Studio’s Holiday Show features prints by artist members and hand-made gift cards. Two Rivers Printmaking Studio supports working artists in their exploration of both traditional and experimental printmaking. Through workshops and exhibits, they provide education and instruction in the art and history of the fine art print. Learn more about the studio HERE. 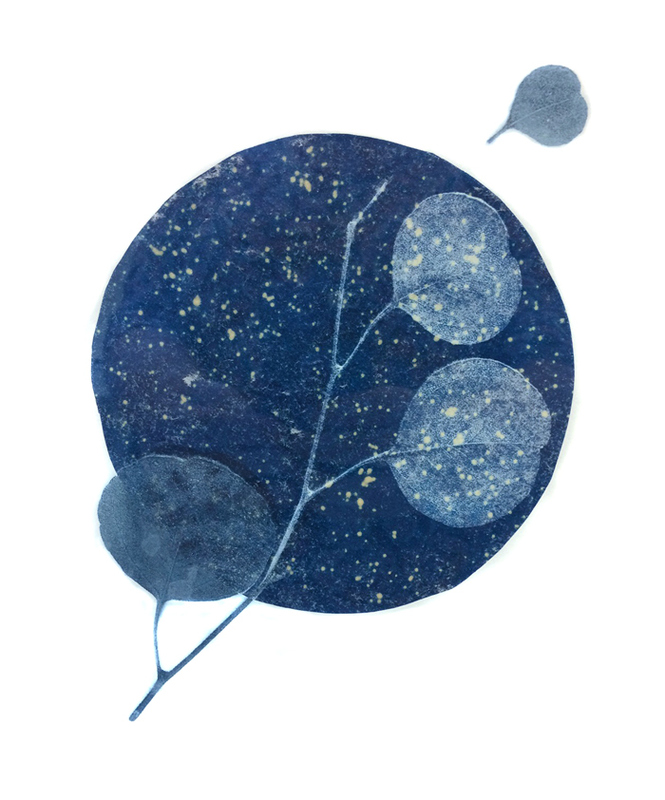 Newbury artist Linda Bryan presents a series of hand-pulled prints, cyanotypes and combinations of etching and cyanotype. 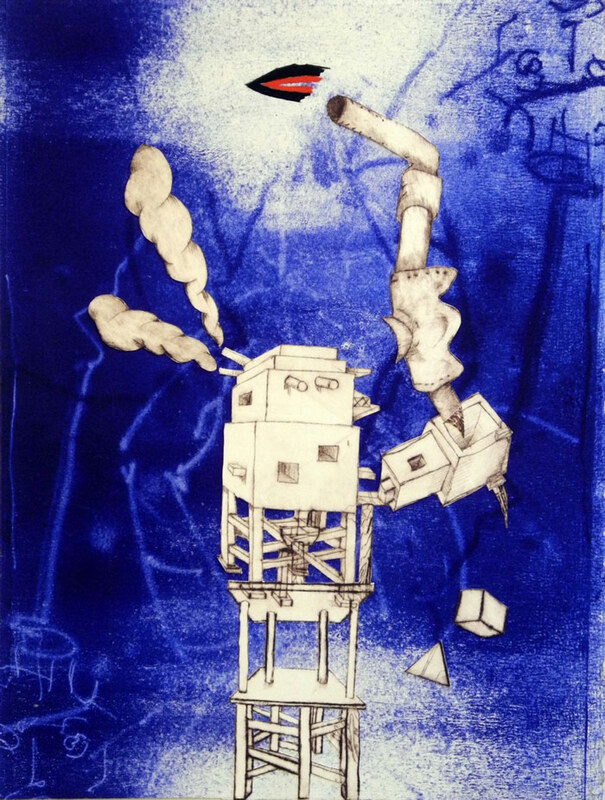 Image: Break Away by Linda Bryan (cyanotype and etching). Courtesy of the artist. I will exhibit a series of prints based on the form of the 17th century emblem book. The series comprises 40 etchings, each 5″x5″ (framed to 16″x16″) and accompanied by a Latin aphorism and English translation. The historical emblem displayed the key elements of the world in schematic and formal spatial arrangements in order to reveal the spiritual, the metaphysical, the abstract, and through symbolic associations and diverse meanings. The makers of emblem books saw the universe as “like a book or mirror of our life and death” (Alanus ab Insulis), investing objects in the world with immediate and enduring universal significance. The reader/viewer finds associations and analogies and constructs significance from the often unpredictable and contradictory friction of text and image; in that gap is a tension that challenges and engages the viewer, much as it confounds and provokes him or her. I take less technical and more makeshift approaches to etching. I start out broadly, a little uncontrolled, but with a clear geometric underpinning. I don’t really want to know exactly how the image will look beforehand — too many unexpectedly and potentially satisfying things may happen to exclude the accidental or the momentarily inspired ahead of time. I work on dozens of etchings at once. The process of etching is physical and elemental, requiring force and pressure, inviting aggression and then delicacy, conjoining fire, water, earth, and air. There is something about etching an image into metal that implies permanence, duration, and enduring presence, and I hope my images mirror the medium in that sense. I embrace themes of loss, futility, destruction, and unexpected, redemptive beauty, themes tied to the tradition of printmaking, whose imagery has always tended toward critical commentary and serious contemplation, and often toward humor and irony as well. Image by Brian Cohen. Courtesy of the artist and Two Rivers Printmaking Studio, White River Junction. Two Rivers Printmaking Studio artist Sue Schiller holds a BA in Fine Arts from Michigan State University and a BPA in Advertising and Illustration from the Art Center School in Los Angeles. Schiller worked for several years as an art director in New York ad agencies, then decided to leave the commercial business and began working as a printmaker and painter. An award led to a scholarship to the National Academy, where she studied the art of the woodcut and wood engraving. Recently, she has been working with Vijay Kumar, master printer at the Manhattan Graphics Center. 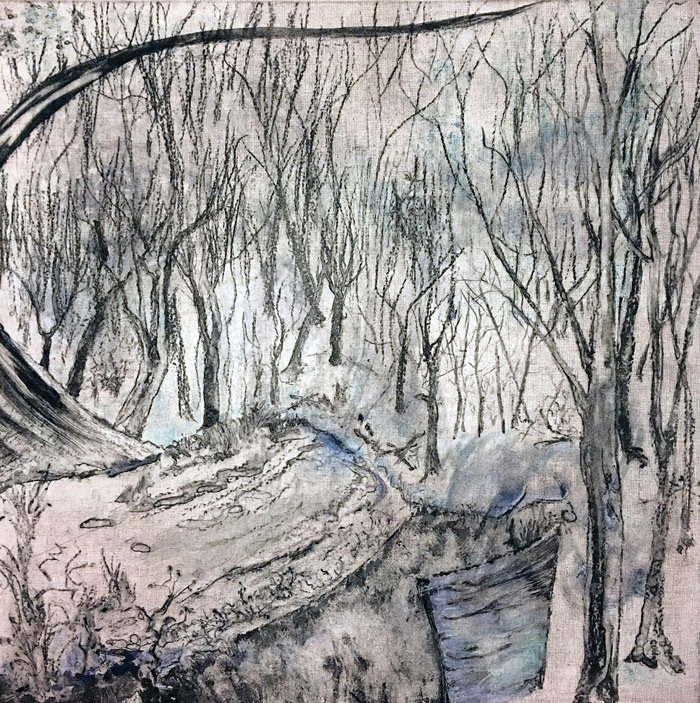 Since becoming a Two Rivers Printmaking Studio member, she has exhibited in many of their studio shows, as well as at the FLYNNDOG in Burlington, the Pegasus Gallery in Quechee, Bridgewater Mills Gallery in Bridgewater and in a juried exhibition at the AVA Gallery in Lebanon, New Hampshire, and at the Manhattan Graphics Center, among other venues. 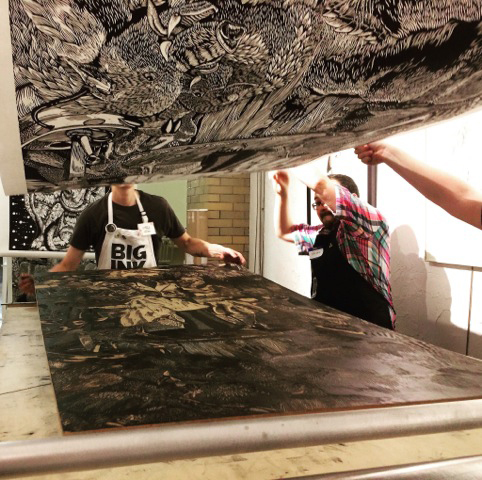 Two Rivers Printmaking Studio is partnering with Big Ink for a one-day, large woodcut printing community event and demonstration. Using Big Ink’s giant mobile etching press, they will be pulling prints up to 40″x96″. 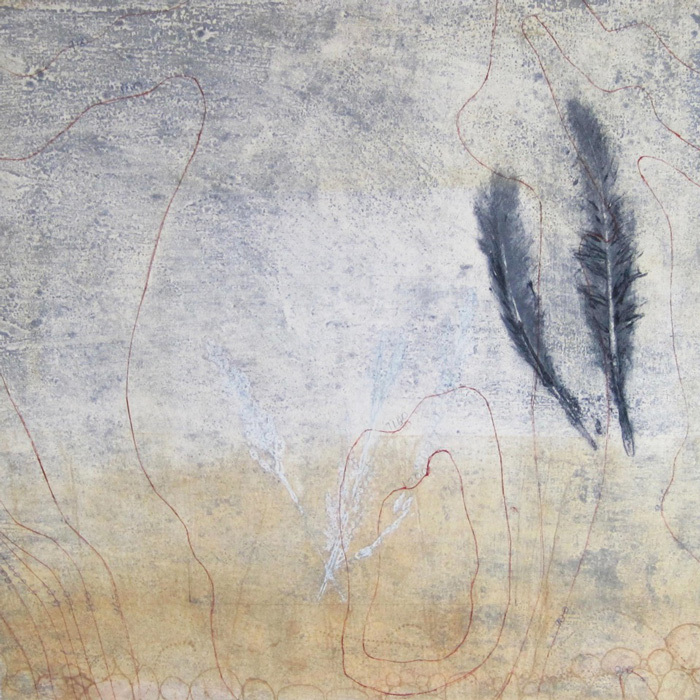 Come and witness the results of area artists working with this ancient printmaking medium. Carol Lippman divides her time between West Newbury, Vermont and Syosset, New York. In addition to being an avid painter, Carol enjoys making daily collages. 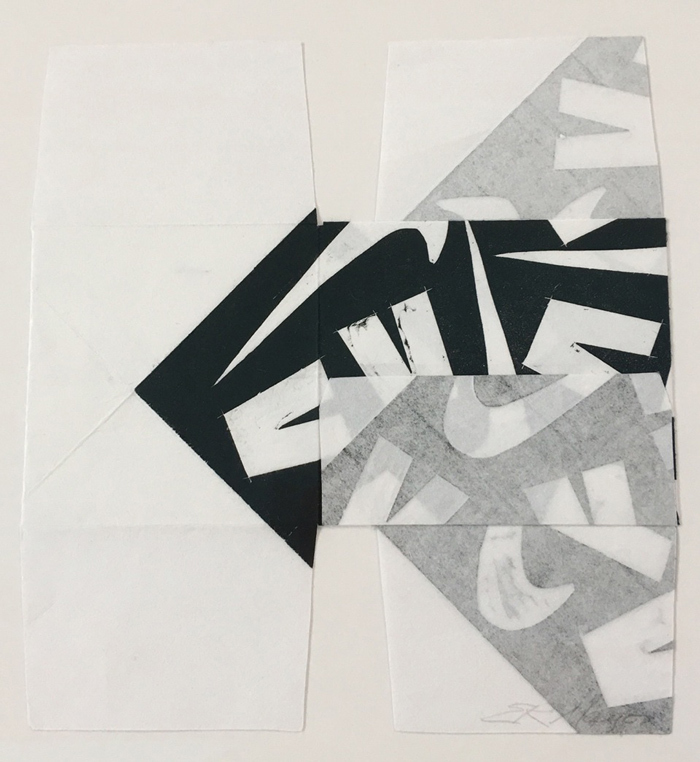 Her prints and collages have been exhibited at group and solo exhibitions at various Long Island and New Hampshire venues. 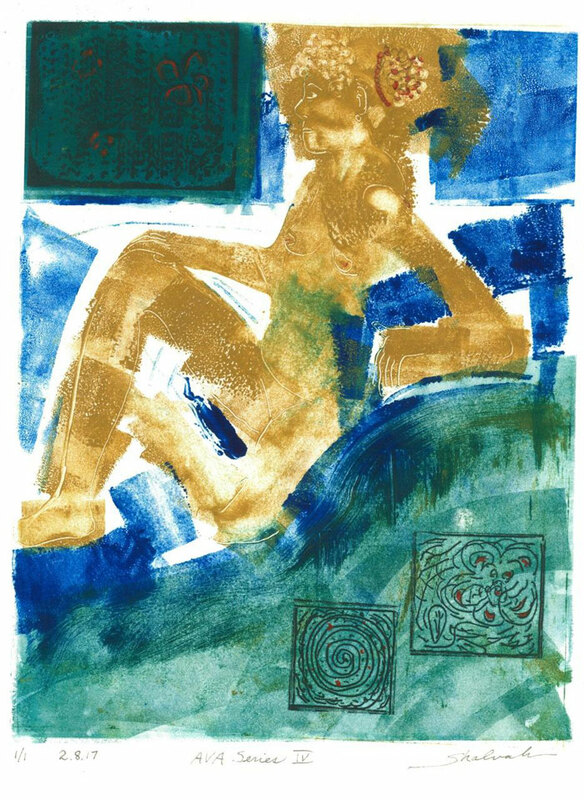 Patty Castellini is known for her colorful abstract monotype prints. 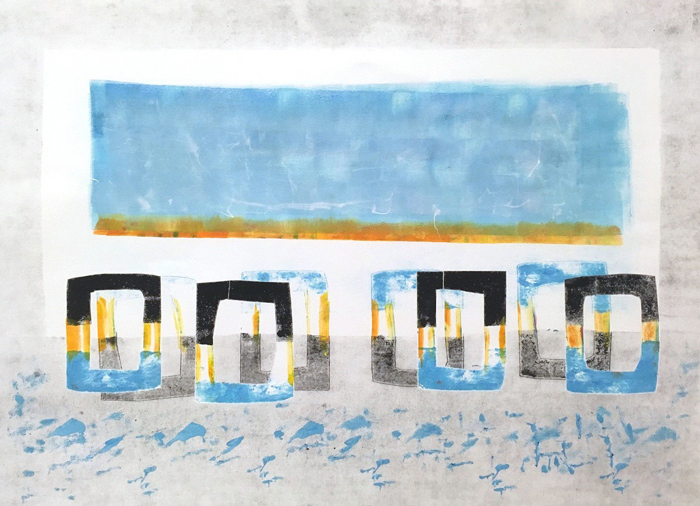 The Enfield, New Hampshire artist first discovered her love for printmaking when she began volunteering at AVA Art Center in Lebanon, New Hampshire–a position which evolved into a twenty-five year teaching career. 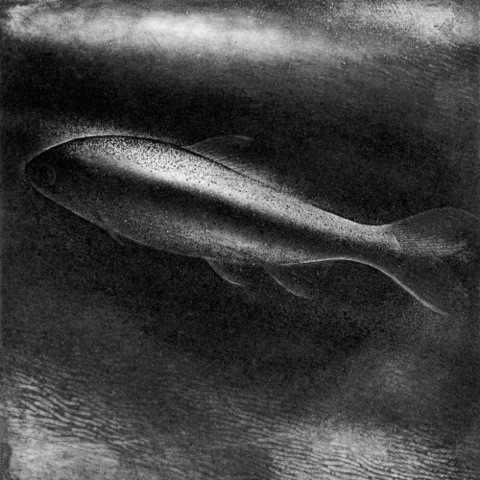 Monotypes differ from other printmaking techniques because they are one-of-a-kind. Inks are applied to a plate, much like an artist would paint a canvas. The plate is then pressed into the paper, transferring the inks, to create the final print. “Body Language” is a collaboration of poems and prints by Don and V. Shalvah Herzberg. 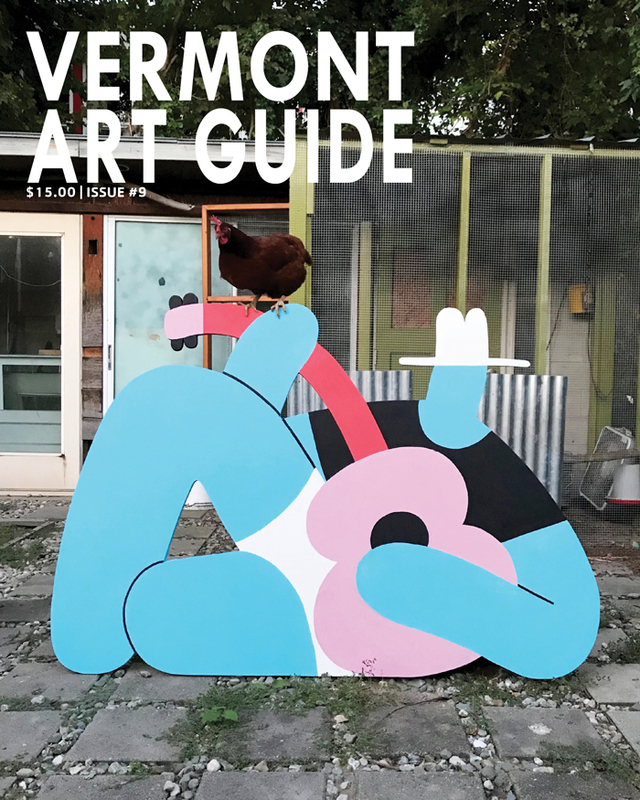 V. Shalvah Herzberg has lived in Vermont for over 35 years, during which time she was a research faculty member at Dartmouth Medical School who took occasional art classes at AVA Gallery and Art Center when it was located in Hanover, New Hampshire. Following her retirement, she concentrated on original design knitting, pottery, and painting. 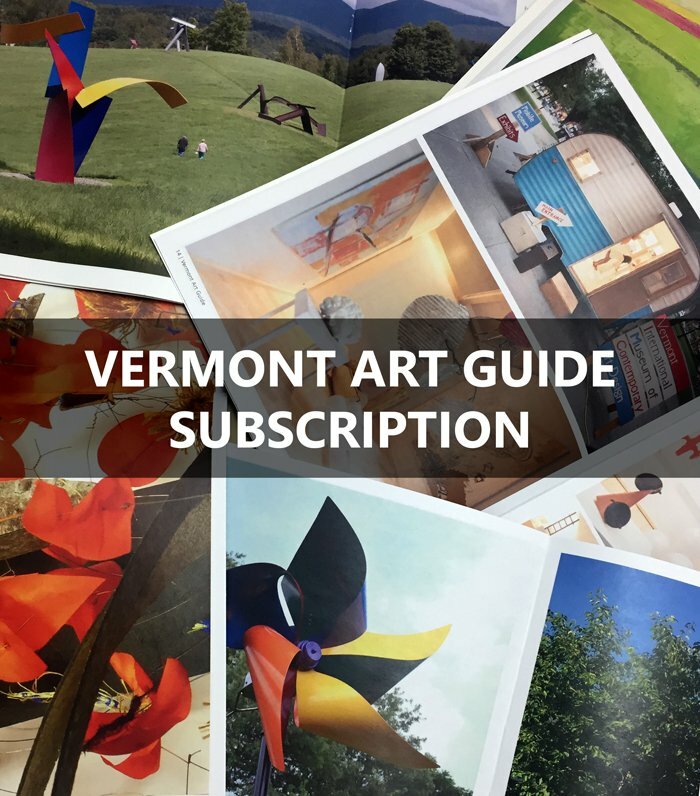 After becoming a juried signature member of the Vermont Watercolor Society, she studied at Two Rivers Printmaking Studio, where she continues to perfect non-toxic alternatives to traditional printmaking. Her images range in subject matter from local scenery and botanicals to the human figure and non-representational abstraction. Two Rivers Printmaking Studio’s Holiday Show! features small matted prints at $40 each or 3 for $100. They make great gifts. Also, they have Gift Certificates available for purchase that may be used towards workshops, print purchases, or membership in Two Rivers Printmaking Studio. 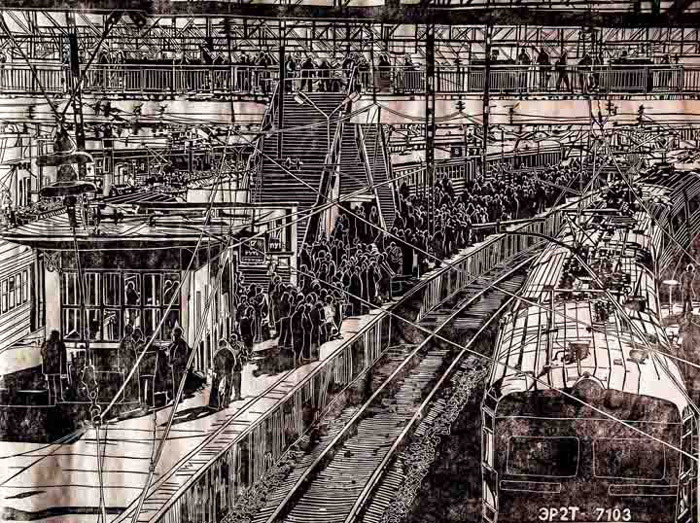 Nori Pepe combines linocut, collagraph, and solarplate etching techniques. She studied printmaking at Union College in Schenectady with Sandra Wimer. Pepe has worked as a circus performer, aerial photographer and member of the U.S. Freestyle Ski Team. In addition to her art, she works for the Killington Mountain School in Killington. Elizabeth Mayor’s woodcuts are sometimes large in scale and created with power tools. At other times, they are small and hand-cut, with the addition of chine collé and thread. Her years as a sculptor can be felt in the dimensional aspects she favors in her prints. Elizabeth received an MFA from Tufts University/School of the Museum of Fine Arts, Boston and has exhibited extensively throughout New England and in New York, where she was included in the American Academy Invitational Exhibition of Painting and Sculpture in 1993. 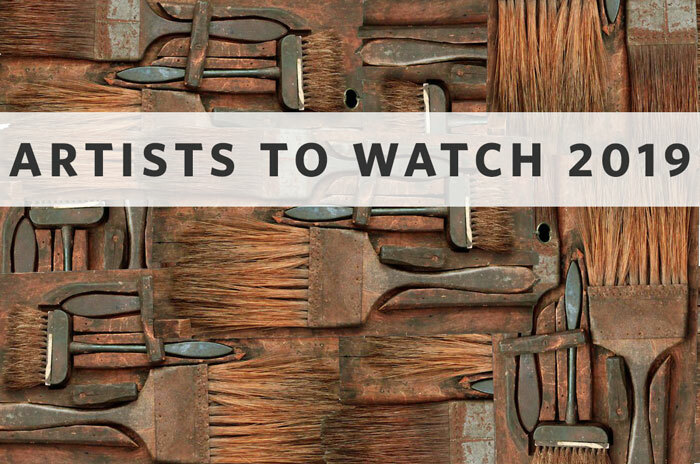 Selected solo shows include Boston’s Alpha Gallery, Saint-Gaudens Historical Site in Cornish, New Hampshire and the Currier Museum of Art in Manchester, New Hampshire, which recently purchased several of her works for its permanent collection. 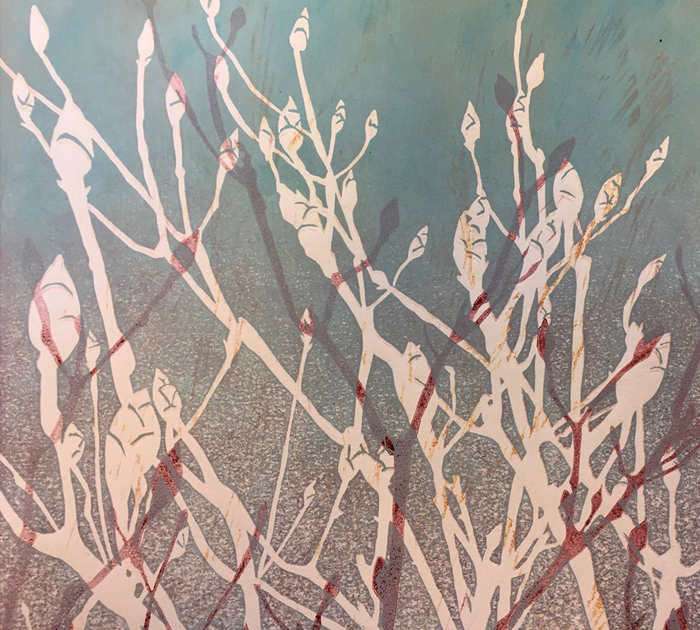 Elizabeth Mayor’s studio is in Hanover, New Hampshire and her art can be seen at McGowan Fine Art in Concord, New Hampshire; AVA Gallery and Art Center in Lebanon, New Hampshire; and Two Rivers Printmaking Studio. 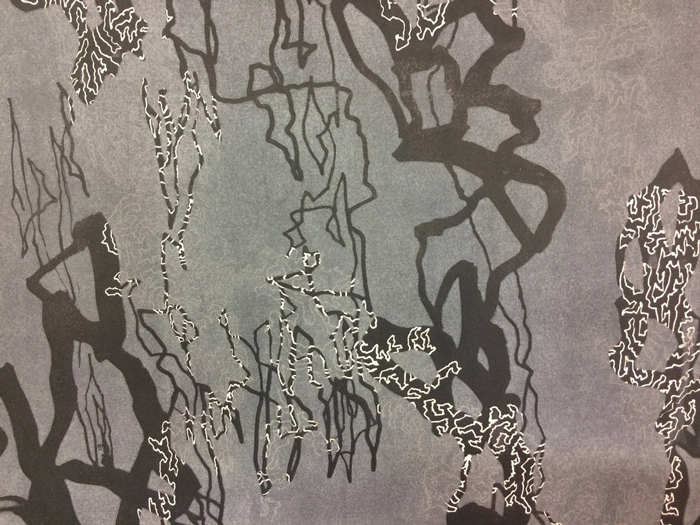 “The Collaborative Print: The Deliberate & The Gestural” is a show of collaborative printmaking by Vicky Tomayko and Bert Yarborough. Vicky Tomayko is works with a variety of techniques to create one-of-a-kind prints and editions of silkscreened books. She manages the print studio for the Fine Arts Work Center in Provincetown, Massachusetts during its seven-month residency program. She teaches silkscreen printing at Cape Cod Community College in Barnstable, Massachusetts and a variety of courses at The Provincetown Art Association and Museum School. Tomayko was artist-in-residence at the Cape Cod Lighthouse Charter School, Orleans, Massachusetts for ten years, and is the recipient of two Ford Foundation Grants. She exhibits her work at A.I.R. Gallery in Brooklyn and at the Schoolhouse Gallery in Provincetown. She has an MFA in printmaking from Western Michigan University, Kalamazoo. Bert Yarborough has a degree in Architecture from Clemson University and an MA and MFA in Photography from the University of Iowa. He currently holds the Sonia C. Davidow ’56 Endowed Chair in the Fine and Performing Arts at Colby-Sawyer College, New London, New Hampshire, where he also serves as the Director of the Marian Graves Mugar Art Gallery and teaches Drawing and Painting. A former two-year Resident Fellow at the Fine Arts Work Center in Provincetown, Massachusetts, he served as Visual Arts Program Coordinator for four years and is now serving as Chairman of the Visual Committee. He has received two New Hampshire State Arts Council Grants in Painting, an National Endowment for the Arts Fellowship in Sculpture and a Fulbright Fellowship to Nigeria, also in Sculpture. He is represented by McGowan Fine Arts in Concord, New Hampshire and was a founding member of artSTRAND Gallery of Provincetown. The collographs, monoprints, woodblock prints of Carol Lippman, of West Newbury, Vermont and Syosset, New York, explore and reflect nature and time. Many of her pieces begin with a topographic map and are built up with layers of colors, shapes, marks, and images that record her sensory perceptions. Carol invites viewers to consider the completed prints as visual dreams.